Total Score: 8.08 - EDITOR'S CHOICE! 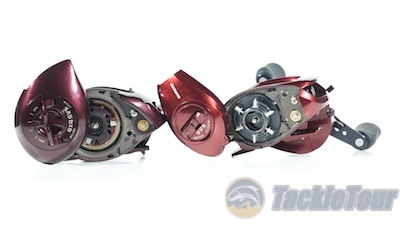 Introduction: Six years ago, in 2004, we looked at a fishing reel largely responsible for many a tackle enthusiasts' journey to the “dark side”: The Shimano Japan Scorpion 1000/1001. 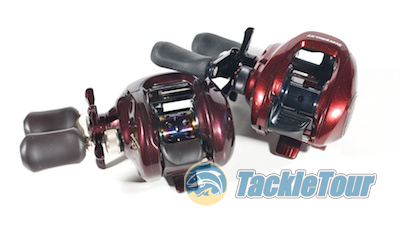 That reel was not the most refined and it wasn't even the best performing reel to be made for the Japanese market, but for many years it was the most accessible reel both in terms of availability and affordability for US anglers. Naturally, once many had the opportunity to sample what this little dynamo had to offer in terms of performance, curiosity lead to other reels made for that overseas market and thus began that journey down a path from where very few tackle enthusiasts return. The popular Shimano Scorpion 1000 series (left) has finally been updated with the Scorpion 1000 XT (right). Fast forward to 2010 and Shimano Japan has updated this popular platform creating, for all intents and purposes, an aluminum version of the Aldebaran. This is a little backwards considering the original Scorpion 1000/1001MG was created long after the aluminum version had already poisoned many a tackle enthusiasts' taste. Earlier this year, we blogged some early photo comparisons between the old and new versions of the Scorpion 1000 series, here now is our full review of the Scorpion 1000/1001 XT. Impressions: Those already familiar with the Aldebaran or even its USDM counterpart, the Core 50mg, will feel immediately at home with the Scorpion 1000/1001 XT. 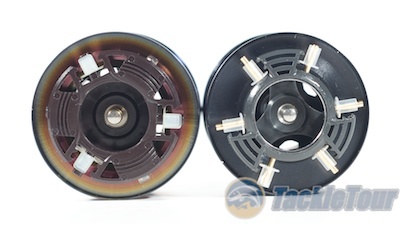 As far as we can tell, this is the same exact reel except with aluminum parts where the other two are magnesium. 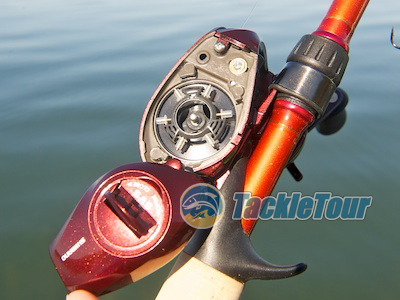 Ergonomically, this reel fits in the palm of your hand even more comfortably than the previous model Scorpion 1000/1001. This is accomplished by somehow making XT smaller than the previous generation Scorpion. The XT is smaller, lighter, and missing the externally adjustable sideplate. But while the new 1000/1001 XT is smaller than its predecessor on the outside, inside, the reel is more robust! 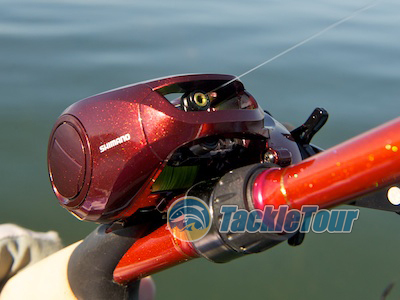 Shimano has taken their oversized gear box design to this diminutive reel and fattened it up where needed while at the same time minimizing the reel's profile where the extra space is not needed. Looking a the reel's non handle sideplates, the difference is dramatic. Looking at both reels' gears, the difference is even more so! Interestingly enough, while Shimano increased the size of the primary gear in this reel, the relative gear ratios are only slightly different - 6.2:1 in the previous model vs 6.4:1 in the new XT. Complimenting the XT's larger gears is a standard sized 80 mm handle versus the previous model's diminutive 70mm handle making the XT even more “Americanized” than its predecessor. Last in our discussion are the spools. 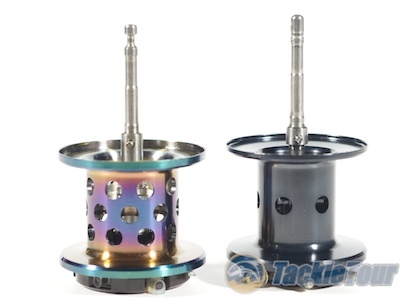 The spools on both reels share the same diameter, but while the XT has slightly more depth, and fewer ports, it is missing that eccentric multi-colored anodization. ... but the same diameter as the previous model. Field Tests: It's been ages since I've fished my previous generation Scorpion 1001. I outgrew that reel quickly once I began fishing other JDM offerings. Nevertheless, I dug the reel out, spooled both it and its newer, sleeker update with some 50lb Sufix 832 and took to the waterways to see how both reels compared to one another in real world conditions. Mounted on an e21 MicroGuide rod, it's almost a perfect match. Casting: Well, that was my intent anyway, but once I mounted the Scorpion 1001 XT on a Carrot Stix Micro and made my first cast, it was game over. 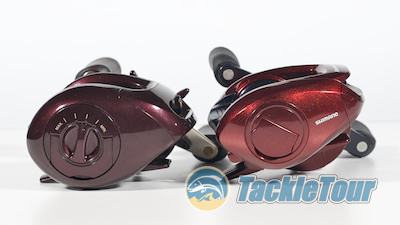 The older Scorpion 1001 was a good reel in its day, but this newer version blows it clear out of the water. Casting in any motion be that overhead, sidearm, lob, or low speed pitches are accomplished with ease, precision, and where needed, distance. The new Scorpion 1000/1001 XT is a casting machine. Shimano really did their homework and delivered a top notch caster here. Gone is the external brake adjustment, in is the familiar Shimano flip hatch. In fact, even though the XT is simply an aluminum version of the Aldebaran, it feels as though this reel outcasts the Aldebaran too. I'm not sure what it is between aluminum and magnesium reels of the same design within Shimano, but I feel this way about the Chronarch D and the Metanium MG/Core 100 too - the aluminum versions of these reels just cast better! The XT now comes with a standard length handle (by US standards). One thing that is missing in the current generation Scorpion over the previous generation is that external cast control dial. 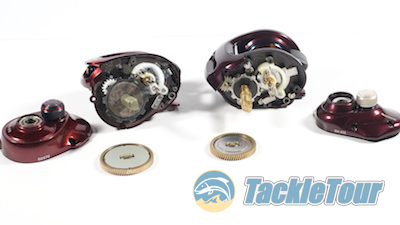 While flipping open the sideplate on the XT is effortless, the convenience of simply turning your reel on its side and making the necessary adjustment right then and there cannot be overlooked. 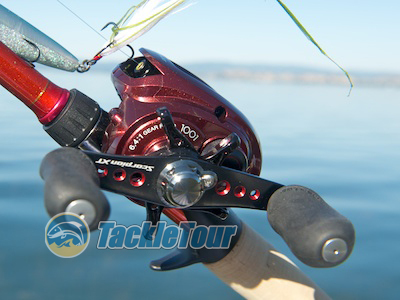 This one feature alone was a strong reason why the previous generation Scorpion 1000/1001 was such a popular reel. A look inside (XT on the left, previous generation on the right). Next Section: Is there any backplay?